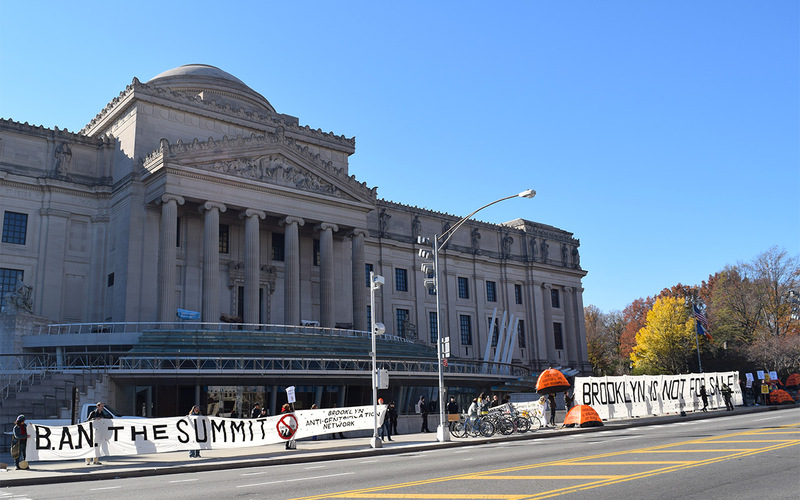 More than 100 activists and artists affiliated with community groups from throughout the city gathered at the Brooklyn Museum this morning to protest its hosting of the 2015 Brooklyn Real Estate Summit. Beginning at 7:30am, protesters were stationed at the Washington Avenue entrance to the museum’s parking lot — through which most summit attendees and speakers arrived — and on Eastern Parkway in front of the museum. 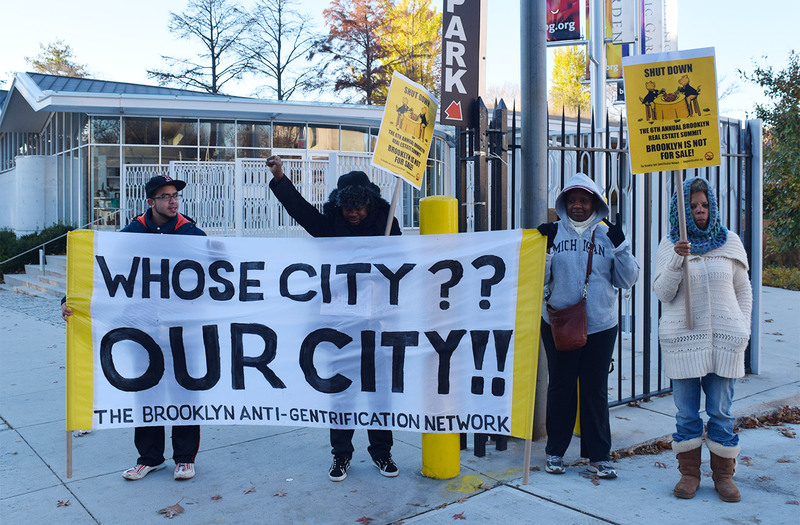 The demonstration was organized by the Brooklyn Anti-gentrification Network (BAN) and brought together members of organizations who are part of its network, a constellation of groups working on gentrification and related issues including police brutality, homelessness, and community gardens. 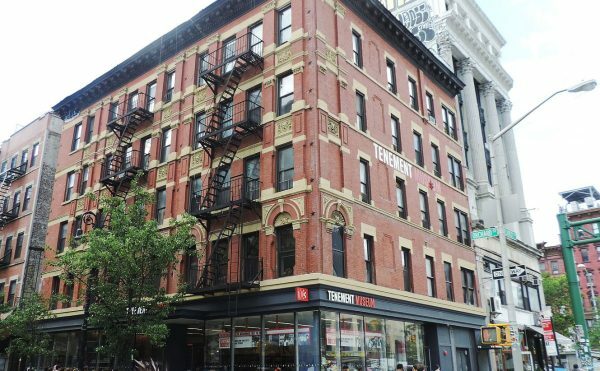 Crying chants including “If we don’t get no housing, they don’t get no peace” and “Fight, fight, fight — housing is a human right,” the protesters spoke with and handed leaflets to passersby. At the parking lot entrance they booed summit attendees (and a few museum employees) as they arrived. 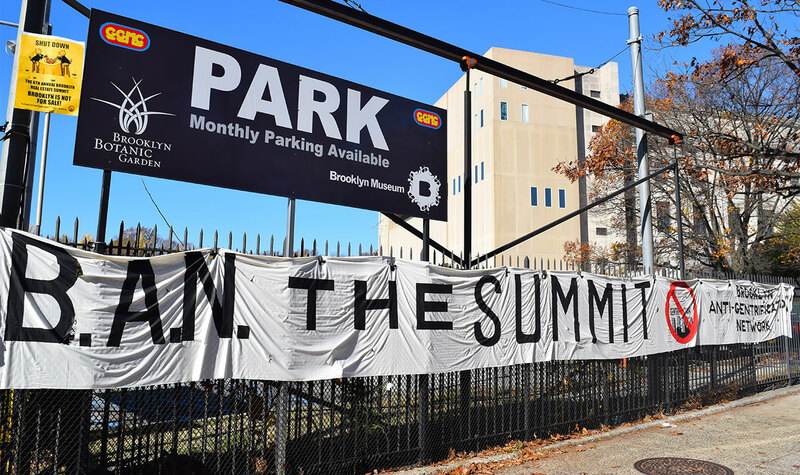 Protesters hung a banner on the fence of the Brooklyn Museum parking lot during the 2015 Brooklyn Real Estate Summit. After beginning with just a couple dozen protesters, the demonstration grew in the buildup to a press conference at noon. Orange tents emblazoned with slogans like “They say gentrify, we say occupy” and “Foreclose on developers not people” were placed on either side of Eastern Parkway. 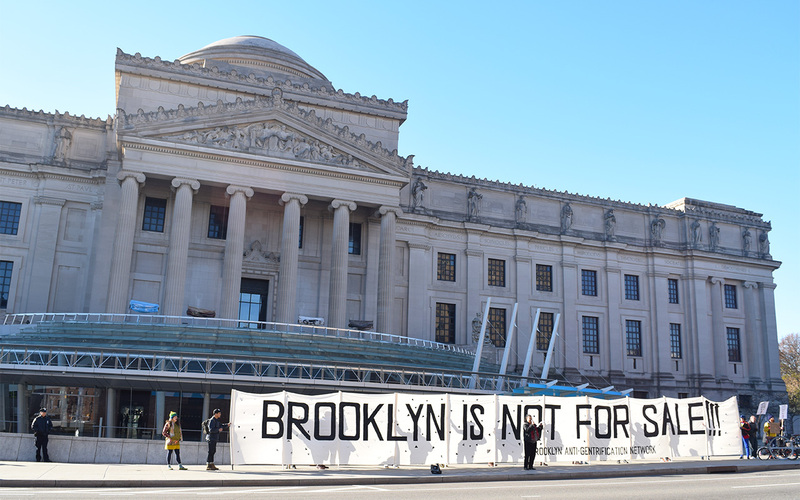 A bright yellow banner incited passing motorists to “Honk if the rent is too high.” Museum security staff and between six and ten NYPD officers stood by throughout, but remained civil. Gradually, members of organizations from other boroughs, artists, and local residents drawn by the loud chants joined the crowd. 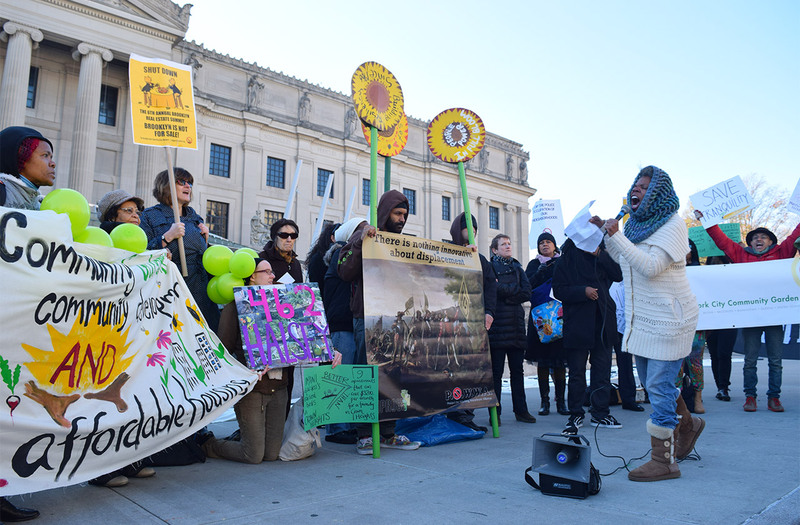 Alicia Boyd of Movement to Protect the People speaks to the protesters outside the Brooklyn Museum at a press conference during the 2015 Brooklyn Real Estate Summit. At noon, Imani Henry of BAN began introducing speakers who addressed how their groups have been fighting various aspects of gentrification. 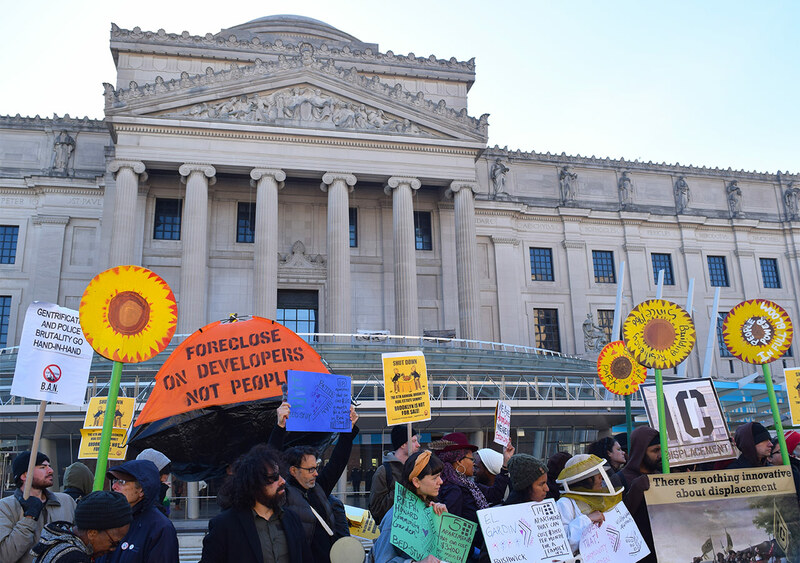 Speakers included members of the NYC Community Garden Coalition, the Sunset Park organization UPROSE, Picture the Homeless, 596 Acres, #TheBronxIsNotForSale, Black Lives Matter, and Movement to Protect the People. One of the most rousing speakers, ironically enough, was a real estate agent named Sharon who has lived directly opposite the Brooklyn Museum on Eastern Parkway for more than 40 years and asked to speak to the protesters after hearing their chants. A second protest, organized by the Artist Studio Affordability Project, is scheduled to take place between 4pm and 6pm.